Villa Elise is situated near to the lovely new Marina Rubicon, with its selection of restaurants, shops bars and sports facilities. Playa Blanca town and its golden beaches are only a pleasant 25 -30 minute stroll away, along the pedestrianised coastal path (the longest in Europe at over 10km). The natural sand beaches of Papagayo are a 15 minute walk. A hire car is not necessary as all facilities, including a supermarket and taxi rank, are close by. Villa Elise is only a 30 minute taxi ride from the airport. The villa is furnished to a high standard, situated between the Rubicon Marina and the famous Papagayo beaches. The comfortable sofas provide comfort whilst relaxing in front of the INTERNET IPTV SYSTEM or listening to music on same. The villa also has full unlimited WiFi Internet Access. Full mountain views to the left with the sea/beach only a 3/4 min walk, ensures an overall peaceful setting. The sun follows the terrace areas until the sun sets. My wife and I bought in Playa Blanca after visiting the area for many years. We enjoy the lovely restaurants that are at The Marina and on the seafront in the town centre. I also enjoy mountain biking locally and running along the coastal path that goes from 300m from our front door to the other end of playa Blanca at the lighthouse. Our children enjoyed many holidays there when they were young and still enjoying coming out to their "2nd home" now they are grown up. Playa Blanca is a family orientated resort and is now described as the "jewel in the crown" of the Canary Islands. We continually maintain the villa to a standard that we can enjoy and allows our guests to feel they have all the home comforts to ensure an enjoyable and relaxing holiday. We have recently purchased the villa next door to Villa Elise, which is also available for rental at https://www.ownersdirect.co.uk/accommodation/p6835311 by searching property ID 6835311. Main bathroom next door to bedroom 1 with toilet, bath/shower and wash basin. En-suite has bath/shower, bidet and wash basin. Downstairs shower room has toilet, wash basin, storage cupboard, iron and ironing board, and inflatables for the pool. A spacious sized living/dining room seating 4-6, a large sofa, 2 seater sofa and an armchair. There is a 32" flat screen TV with satellite/DVD, air-conditioning, dining table and chairs. Kitchen is fully fitted with dishwasher, microwave, oven with a halogen hob and extractor, full size fridge/freezer, stainless steel kettle, toaster, crockery, glasses, utensils and sharp knives etc. There is an international golf course at Costa Teguise, a 45 min drive away. A 9 hole pitch and put is just a 15 min walk along the coastal path just beyond the marina. Notes on accommodation: Prices shown are a flat rate regardless of party size (max 4 people sharing). The villa is suitable for families with children or elderly as it is set in a peaceful location but not too far from good restaurants and amenities. Outside: Sun terrace with 2 x tables (8 chairs), 4 x sun loungers and barbecue on the ground floor terrace, on the upper terrace there is 1 x table (4 chairs). Shaded area on the terrace area always available. Private heated pool, complete with cover. Utility Room: Solana/utility room has a washing machine and clothes horse, also cleaning equipment, mops, brushes etc. Immersion heater for continuous hot water. Cleaning / Towels / Linen / Maid service: Towels and linen are included in the price (not beach towels). The villa will be cleaned once a week with a towel and linen change(For stays of more than 7 days). A daily clean can be done at your request at an additional cost. Other: Apart from the second bedroom, each room has access to the patio/balcony area through patio doors on both the ground and first floor. We really enjoyed our stay at Villa Elsie , fantastic location within walking distance of Marina Rubicon, superb facilities. Good communication with owner . The outside cleanliness from the contractor needs improving. We have just returned from a week’s stay at this property and cannot complain about anything there is everything you would require also the quality of the towels and bedding was first class with a nice welcome pack,the property was immaculate and the furniture outside was very comfortable in a nice quiet area,they is plenty of books,games,few WiFi and a great Tv with SKY etc . Just back from a wonderful stay at Villa Elise. Lovely bright rooms, had everything we needed and the internet TV in the evenings was very welcome given a January stay. Perfect location with a choice of shorter walk into Marina Rubicon or longer walk into Play Blanca. Plenty of places to eat out with our favourites being Terraza La Cubierta overlooking the Marina and the Italian Avenida 55 in Playa Blanca which is worth seeking out as it is back from the seafront. Very much looking forward to returning next year! Thank you for submitting a review it is much appreciated. 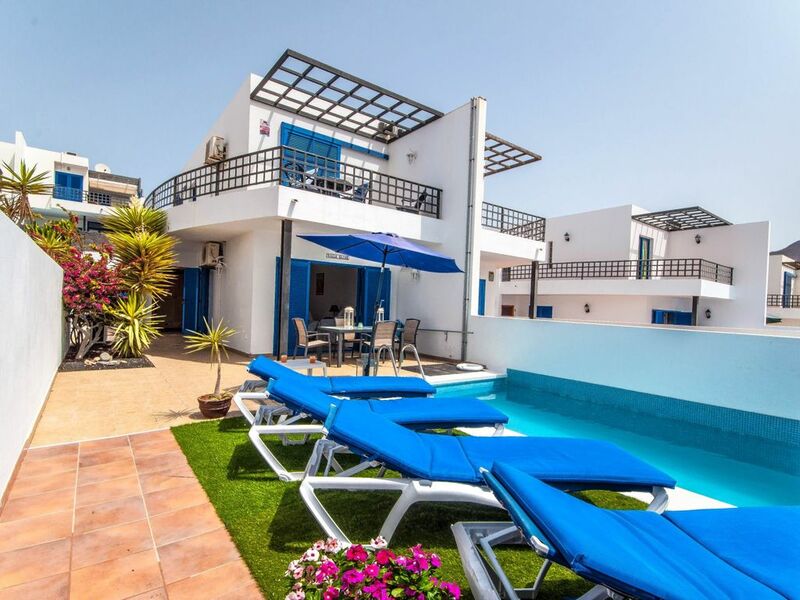 We are so glad you enjoyed your stay at our villa and had a great holiday in Playa Blanca. We look forward to seeing you again next year. After staying here last year we decided to go again this year. Had a great time once again. Highly recommend to anyone thinking of booking. Thank you Gordon for your great review. We really appreciate it and are delighted you had such a good time. Look forward to welcoming you back next year. Cycling for enthusiasts is a must, as Lanzarote hosts fantastic roads for cyclists to enjoy, whether you are a keen cyclist or would rather enjoy a peaceful cycle along the coastal path, the choice is yours. Bikes can be rented from Playa Blanca at reasonable rates, which are discounted the longer the rental. Marina Rubicon is ideal for people who like to scuba, sail and enjoy life on the water. There are kayaks for the kids. Marina Rubicon hosts the most magnificent yachts, bars and restaurants overlooking the marina, which entertains the children watching and feeding the fish swim below you whilst you dine. There is also a bowling alley in the shopping centre at the marina. The villa is a short walk to the world famous Papagayo beaches. Dorada Beach is a 20 min walk towards Playa Blanca and has lots of bars, restaurants and fun activities for all the family. There is also a small rocky beach just a few minutes from the villa. Arrecife airport is an easy 20 min drive away. Car hire is recommended but is definitely not essential. If you do not want to hire a car, a taxi will take you to Playa Blanca for approx 40/50 euros. Local taxi service to centre of Playa Blanca approx 4.00 euros. If you wish to visit places of interest on the island we would recommend car hire. Playa Blanca town is a 2km/25 minute walk or a 5 minute drive from Villa Elise. Timanfaya Nature Reserve (volcano trip) is a 20-minute drive. The famous caves of Lanzarote are a 45 minute drive up the coast. Marina Rubicon offers a wide range of water-based sports activities, including glass-bottomed boat trips around the coastline, yacht hire, scuba-diving and snorkeling. The marina holds a market every Wednesday and Saturday. Many art galleries are based within the Marina. Restaurants offer Spanish, Italian, Tapas, Tex-Mex and other cuisine. There is an on-site supermarket, bank and cash points. Booking Notes: A 25% deposit is charged to secure the booking and the balance is due 8 weeks from departure date. The Air-Conditioning is on a meter basis, the pool is solar heated all year round. Changeover Day: Main changeover day is Thursday or Sunday but all days can be accommodated subject to availability. Notes on prices: Rates shown are for up to 4 persons per week in UK pounds. The pool is solar heated all year, and during the summer months, this will be sufficient for swimming and is included in the prices shown.